Free Inventory Management Toolkit for Retailers. A compilation of inventory resources to help you save time, boost profits, and reduce shrink. Get everything you need to successfully manage your inventory. This toolkit contains 9 high-value resources designed to help you stay on top of stock control. Get them for free with 1 easy download! Get pointers from people who specialize in stock control. This bundle contains an expert roundup packed with inventory management advice. Are inventory counts disrupting your store operations? We’ll give you access to handouts and a handy app that can make stock counts a whole lot easier. Sitting on surplus inventory? We’ve got a dedicated resource that offers smart, proven tips for getting rid of excess stock. Shrinkage can cost you serious profits. Discover practical ways to minimize it and to help your business grow in the process. Ensuring you have the right products at the right time is critical to a successful business. Wise up on actionable tips to do just that. This resource is for retailers looking for tools and information on inventory management. If you want to learn how to successfully implement good processes and systems in your business, this toolkit is for you. We’ve included helpful guides, templates, handouts, and other resources on the most common pain points within the inventory management area — so this toolkit has something for retailers of all levels and sizes. This resource has tips and examples to help you win at inventory management. From picking the right solution and entering your products, to tracking stock levels and automating the process, this guide has you covered. We compiled some of the most important metrics that you should track in your business, and put them into easy-to-use spreadsheets that automatically calculate metrics such as GMROI, conversion rate, stock turn, margins, and more. In this 30-minute workshop, retail inventory expert Jordan Lewis will teach you how to manage your inventory the modern way. The best mobile inventory barcode scanner app for retail. Perform inventory counts and partial counts, then process deliveries and transfers — straight from your iPhone, iPad, or iPod Touch. Dealing with tons of excess stock? This guide provides several tried-and-tested tips to help you sell or liquidate surplus inventory. This detailed handout provides pointers to help you streamline your physical inventory counts. Struggling with inventory discrepancies and shrink? Here are a few key tips to consider for maintaining inventory accuracy and reducing shrinkage. Need to do partial inventory counts (aka cycle counting)? We’ve put together a nifty handout to help you throughout the process. We asked 12 retail experts to share their #1 inventory management tip and rounded up their answers in this handout. For most retailers, inventory management is the lifeblood of the business. It’s essential that you know the ins-and-outs of how to manage your stock so you can set your business up for success. There are several areas you need to be familiar with when it comes to inventory management. You need to know how to maintain accurate inventory, how to reduce shrinkage, how to conduct inventory counts efficiently, and how to deal with surplus stock. This resource covers all these topics and more. It’ll give you the information and tools you need to successfully take control of your inventory. What makes this resource different from other resources on the same topic? Other inventory resources cover just one topic or provide only one piece of content. 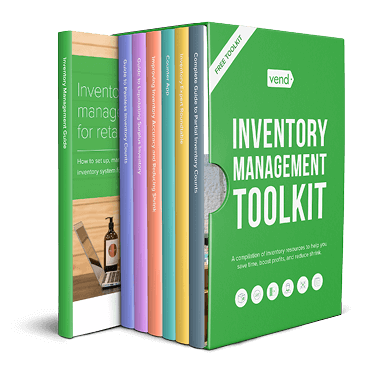 In addition to covering multiple areas within inventory management, Vend’s toolkit also comes with several extra resources. Here at Vend, we specialize in inventory management. Our passion is helping inventory-based retailers win, and we have an incredible team of retail and inventory experts creating valuable, actionable content for our community. We compiled this resource to provide you with a one-stop shop for all that inventory knowledge. You won’t find a more comprehensive toolkit out there! I’m not a Vend user. Will this guide be useful to me? It sure will. 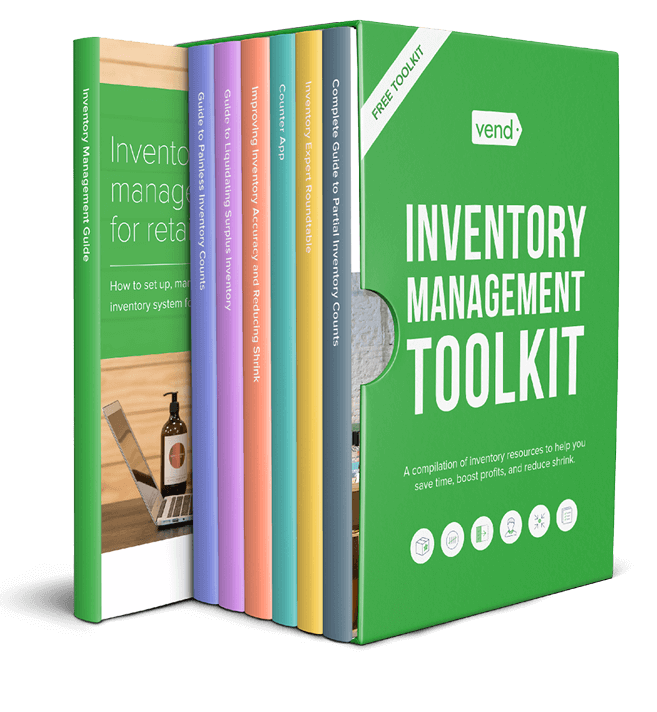 While we’d love for you to check out Vend, this toolkit is designed to give you unbiased information and knowledge on inventory management. You don’t have to be a Vend customer to find value in it! Get your free Inventory Management Toolkit now!